Midrange control. 15dB boost or cut of midrange at a center frequency determined by the switch selection. Turning the control clockwise boosts the mids. Turning the control counterclockwise cuts the mids. The detent, or “click,” in the center of the control is the “flat” position, zero boost or cut. Mid frequency switch (ZB-4.3 only). Down position @ 250 Hz. Center position @ 400 Hz. Up position @ 700 Hz. 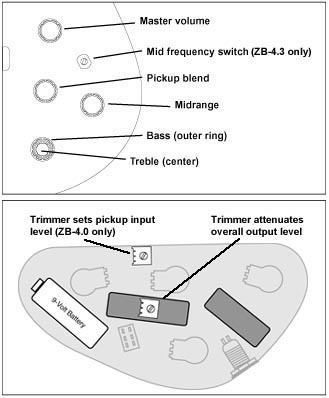 Pickup input level trimmer (ZB-4.0 only). Attenuates input level from pickups. Turning clockwise increases input level from pickups to preamp. While this increases gain, too much input level can cause distortion. Factory setting is set clockwise, just under the first sign of distortion. Output level trimmer. This control on the circuit module attenuates overall output level. Its factory setting is the mid position.